Valley Craft steel big green HVAC hand truck. 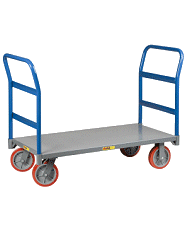 Make handling those large bulky heating and cooling units safer and easier with an ergonomic hand truck designed for efficiency and built for durability. The 4-wheel design with loop handle makes transporting oversized loads a much more efficient task by increasing productivity and decreasing the chance for damage. The forks measure 24-inches and allows for safe loading and unloading of large heating and air conditioning units, or any other large palletized load, while over-sized fenders stabilize the load. The foot-activated trip pedal locks and unlocks fork position. Simply slide the angled truck forks under the load, tilt forward to lock forks in place and break-over the load. Forks lock against the frame for compact storage. Available in green color. Truck shoe length 13-3/4-inches. 600 pounds load capacity. Frame measures 26-inches width by 62-inches height by 22-inches depth. Made in USA.